I never used to like savory muffins. I could never explain why until I ate one that was utterly delicious. Only then I realized that all previous ones were simply tasteless. That particular one that got me hooked on savory muffins was baked by fellow Dubai food blogger Angela who specializes in gluten-free and low carb cooking and baking. I met her for the first time in person on a little market where she was selling her muffins, tartlets and other goodies. We bought our entire lunch at her stall. Afterwards I got orders from my family to make savory muffins at home. The original recipe calls for parmesan and grated cheese topping. I wanted to cut those out (although I enjoyed them a lot when I ate Angela's muffins) and make them dairy free without loosing flavor. At this stage I realized I have to season my muffins in exactly the same way you season all savory main dishes: bring on the salt and pepper, garlic, herbs and spices. 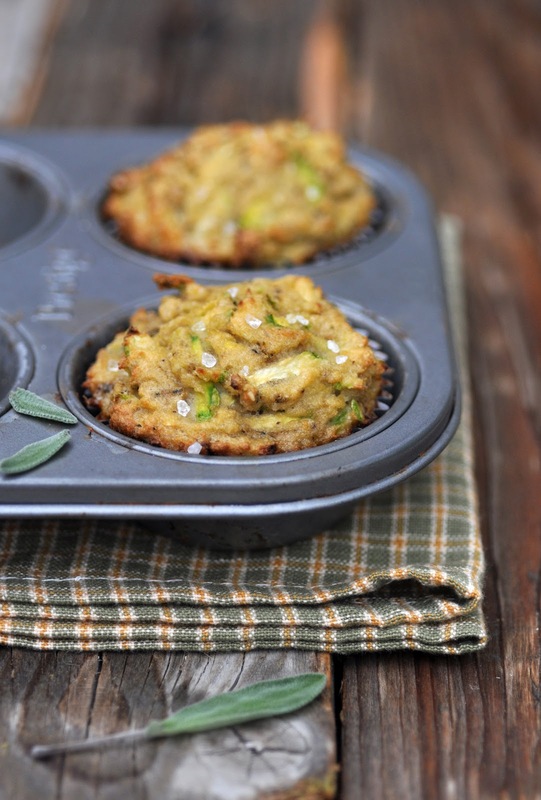 The result: the most flavorful savory muffins I have ever had. Full of flavor, and very filling. All you need if you crave something savory as mid afternoon snack. And surely good as a portable lunch. But let me tell you a secret: they are actually best to have straight from the oven. Whenever I make batch, they are usually gone before completely cooled. Preheat oven to 200C/400F. Grease or line muffin tin. In a food processor, combine Brazil nuts, sage, garlic and olive oil. Blend until it has become a meal. Set aside. In a bowl, whisk the eggs. Stir in coconut oil, water and salt. In another small bowl, combine coconut flour and baking soda. Blend flour mixture into egg mixture until well combined. Stir in grated zucchini and 1/4 cup of the Brazil nut sage mixture. Spoon batter into prepared muffin tin. Sprinkle with some coarse sea salt. Bake for 25-30 minutes, or until top are golden brown.